The rare Turken chicken breed also referred to as the Transylvanian Naked Neck is easily identified by it's lack of feathers on it's neck and vent. Origin: The Transylvanian Naked Neck Turken was originally discovered in Transylvania but the breed was furthered developed in Germany which is when this bird was first named "Turken". The reasoning behind the name Turken is because people mistakenly thought that this chicken breed was a cross between a chicken and a domestic turkey which was not the case. True Naked Necks were recognized by the APA (American Poultry Association in 1965 and were brought to Britain some time in the 1920's. The European Turkens of today are quite common there and in South America but are considered a rarity in North America. 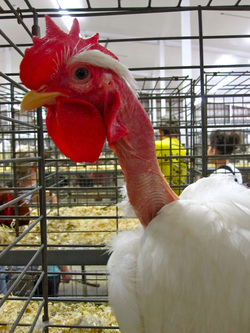 The gene that produces Naked Neck chickens is easily introduced into other breeds creating a hybrid Naked Neck chicken but birds produced by this method are not true Naked Necks as recognized by the APA. "There are other breeds of naked necked chicken, such as the French naked neck, which is often confused with the Transylvanian, and the naked necked gamefowl" (1). Turkens are friendly, easy to tame, sturdy, healthy and calm natured. They can withstand colder temperatures. The hens go broody easily and lay light brown eggs. Plumage color is usually black, buff, red or white. ​See our featured video of Transylvanian Turkens below..